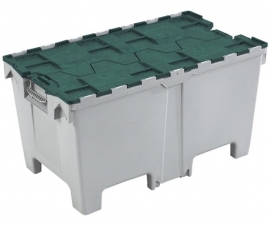 Welcome to our large range of pallet boxes ideal for a bulk storage and large items. 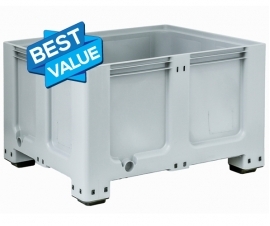 We offer plasitc pallet boxes in a variety of sizes, with and without feet or runners, as well as pallet boxes with drop down side doors for easy access. 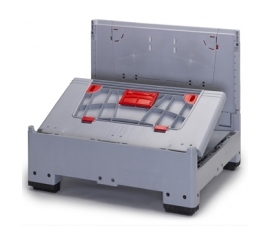 Folding (collapsible) pallet boxes and plastic pallets are also available. If you need help please contact us! Ventilated (air holes) pallet boxes allow for air circulation, this is especially useful when storing perishable goods, such as fish, fruit and vegetables. Drainage plugs and taps can also be fitted. Collapsible / foldable pallet boxes are very convenient and save on storage space when not in use, they can even be stacked upon each other when fully collapsed. In our range you will also find one or two pallet box models with drop down doors, allowing for easy, fast access of stored goods - ideal for storing cables and displaying goods in stores. Lids are also available and can be stacked upon. 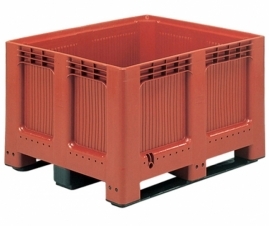 Pallet Boxes are available in ISO and EURO Standard dimensions.